Price includes shipping within the USA via USPS. RIDE THE FRONTIER OF YESTERYEAR! Route 66: The Romance of the West.—Once, the West was wild. And so was an automobile ride from the eastern edge of New Mexico through the great Mojave Desert. From the time the world discovered Grand Canyon was a wonder, the road trip was a craze waiting to be born. As wagon trails and railroad ties gave way to Route 66, a nation learned to tempt the West in newborn motorcars. What they found was drastically different from the West one finds today. Bootleggers prowled the Painted Desert. Petrified Forest fought a war with a formidable mountain-lion queen. A self-proclaimed prophet preached out of the Cave of the Seven Devils (polite folks never asked him about his murder trial). Walt Disney's heir apparent drew cartoons of Meteor Crater, while a retired circus clown penned poems of the Old Frontier. And who was the roadside's most popular personality? Probably a Bluewater, New Mexico, Indian trader crippled by polio: He took Navajo pals gambling in Las Vegas. 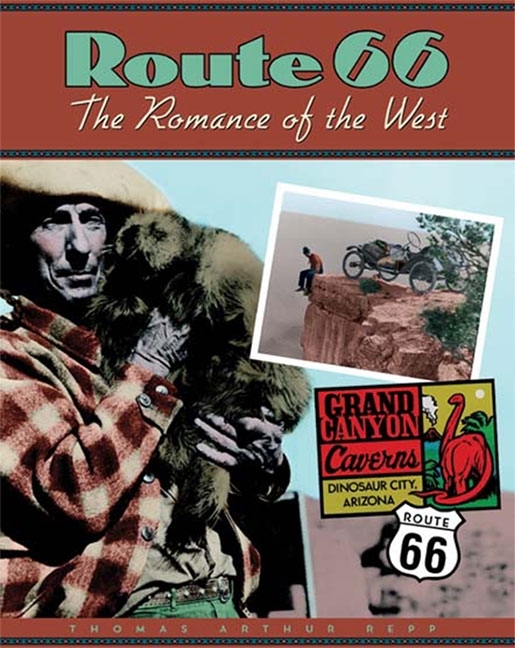 These stories—and others like them—comprise Route 66: The Romance of the West. And no one could have set them down like Thomas Arthur Repp. No one but Mr. Repp has spent years working with the families who bravely settled the early western roadside—ferretting out their forgotten histories—compiling hundreds of their interviews, homesteading papers, newspaper articles and photographs—and making sure their words gallop over every page. So rev up your 1926 Hupmobile, or better yet, saddle a horse. This trip, you're going where skies are not cloudy all day. Onto the frontier of yesteryear: Route 66: The Romance of the West. Los Angeles Times Best Books of the West 2002! Bound Hardcover. 9" x 11.2" x 1". 214pp.